PITTSBURGH — Ben Roethlisberger shook off a pair of interceptions to throw two late touchdowns, including a 4-yard strike to Antonio Brown with 9 seconds remaining to lift the Pittsburgh Steelers to a 31-27 victory over the Baltimore Ravens on Sunday night. Brown caught Roethlisberger's pass just short of the goal line and stretched the ball into the end zone with his left hand to cap a wild fourth quarter and give Pittsburgh (10-5) its second division title in three years. 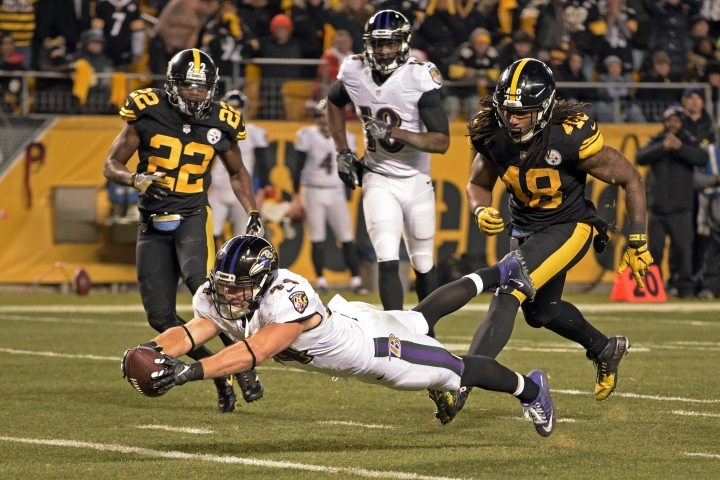 The Ravens took the lead on Kyle Juszczyk's 10-yard burst up the middle with 1:18 remaining. But Roethlisberger calmly led the Steelers 75 yards in 10 plays, the last 4 coming as Brown fought through a pair of tacklers to assure the Steelers of a third straight playoff berth. The Ravens (8-7) were officially eliminated when Joe Flacco's pass near midfield was intercepted on the final play. Kansas City secured a playoff berth with the Baltimore loss. The Steelers have won six straight and ended a four-game losing streak to Baltimore.